Howard Park McMillen, 98, of Clinton, passed away peacefully at home with his loving family at his side, on November 23, 2018. He was born in Home, Pennsylvania on October 7, 1920, to parents Samuel Augustus McMillen and Emma Martin McMillen. Howard met and married the love of his life, a fellow student at Moody Bible Institute, July 3, 1948. They served with the Ramabai Mukti Mission in India, a home for underserved orphans and women. For the past fifty years, after returning to the U.S., he continued faithful service to God in community and church ministries. He will always be remembered for his ready laughter, sense of humor, love for his family, humility, and steadfast commitment to his faith. Twelve grandchildren and fourteen great-grandchildren. The family will receive friends Wednesday, November 28th from 5:30 PM until 7 PM at Temple Baptist Church, Powell, with the memorial service following at 7 PM. Rev. Clarence Sexton will officiate. A family graveside service will be held at Oak Ridge Memorial Park. To send flowers or a remembrance gift to the family of Howard Park McMillen, please visit our Tribute Store. 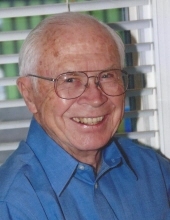 "Email Address" would like to share the life celebration of Howard Park McMillen. Click on the "link" to go to share a favorite memory or leave a condolence message for the family.